This species is very widespread, but usually uncommon to rare at any given site, although most populations are considered stable. It is distributed in the entire Ohio, Cumberland, and Tennessee River systems and the Mississippi River drainage from Wisconsin and Minnesota, south through Kansas and Oklahoma to Texas, east to Louisiana and Mississippi through Ohio. Comments: The wartyback is a straw-colored mussel that looks very similar to its closest relative, the pimpleback, but differs by having fewer and larger pustules on the shell. These knob-like structures are most notably arranged in diverging rows exactly opposite the knobs on the opposing valve. These features are an adaptation to help this mussel stay anchored in the substrate, especially during flood conditions. In addition to the pimpleback, the wartyback can also be confused with the threehorn wartyback. Another characteristic to help differentiate this shell is a pronounced wing on the posterior portion of the shell. 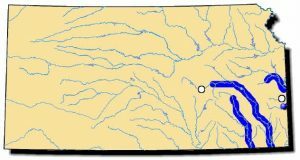 The wartyback is found in most southeast Kansas rivers but is not numerous. 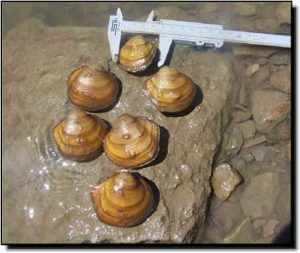 Within some of the best Verdigris River mussel beds, one wartyback will be found for every 100 mussels identified.